The only nice thing was the pool and that this place is right on the beach This place is not and should not be called a "resort". It is very old, run down, houses college students and rents to people that actually live there. It is Very noisy and the kids are roudy. There is no ice machine and elevators keep breaking down. The gym is dirty and musty. Registration desk is a block away. Entrance is frightening with questionable characters loitering. Lobby is dark and forboding and hasn’t been updated in decades. The elevators do not work. The stairs are dirty and smelly. The hall ways are dirty and smell of urine and marijuana. The room was old but it appears to be clean. We could smell a natural gas leak so we cancelled and went to another hotel. This is not a resort !!! Hidden fees.. parking and resort fee . it was like staying in a motel. 1 of 3 elevators were working. The stairs were dirty and smelt like urine. A terrible way to spend your vacation. This hotel takes alot if work to check in..I have stayed here many times and it keeps getting worse..I will not go back... The rooms are moldy, some rooms have no air conditioning, the resort fee is $10. But the swimming pool and jacuzzi are both closed down with no date for reopening but they still charge the resort fee period. The parking fee has increased from $18 a night to $24 a night period. The front desk has moved and it is a lot of work to go check in get your baggage and go check into your room do yourself a favor do not stay at this place. The property is in a defunct mall with only a handful of shops open. The rooms were poorly maintained, floors dirty, and in general need of updating/repair. The cable had been ripped out of the TV in my room and was just left lying on the floor, and the internet never stayed connected for more than 10 min at a time. The AC was a loud window unit and I found myself looking under the beds to make sure nothing would crawl out in the middle of the night. Overall a poor nights sleep and not a place I would recommend. Would never stay here again! Entrance smelled like cigarettes and the rooms smelled like bug spray/ bathroom had cracked wall, chipped paint in the tub, shower head dirty/ when I opened the top of the coffee pot there was a filter left in It and a bug crawled out/ stain on the quilt/ broken blinds and closet door/ noisy portable air conditioners/stinky towels/ only 1 of 2 elevators was working very slow. The pool water was warmer than the hot tub. The front desk did try to accommodate my request to switch rooms - we saw a total of 6 rooms which were all gross! Too late in the evening to switch hotels we ended up settling for a room just to sleep in, we were out of there before 10am. They credited my card $10 resort fee, I feel they should have refunded the total or at least half of the room cost for the inconvenience and wasting my time switching rooms. My daughter and I had a great stay at this hotel. We were very pleased with our room. This will be where we stay every year for our vacation. Thank you to the friendly staff. Special thanks to Gibel for her fenominal people skills. Everything, except for the air conditioning going out mid-stay, was absolutely fantastic! when i first walked in the hotel, there was a stinch and also carpet was dirty in the hall area. the room was nice and clean and smelled nice. the staff couldnt provide good answers to my questions.when booking the hotel i was advised it would be 150 deposit. then when i got there an additional 100 was placed on my card as a hold. i was provided with room 436 that was already occupied. i eventually got into room 722. the shuttle driver joe was awesome. he was very nice and made me feel welcomed. the other staff was mediocre. We had a wonderful stay. The location is a perfect 10. The staff was friendly. The bed was comfortable. The pool is excellent! It's old (thus the name historic) so there is a mildew smell. We bought a scented candle. Problem solved. The a/c works great. It was 90 degrees everyday. Tv was good. The only problem is the old musty smell and the dated bathroom. If they replaced the carpet in the halls, that would be a huge plus. But there's 24 hour security there. I always felt safe. Pretty good place overall. The room was great and very spacious. It even had a kitchenette! We enjoyed everything except the lobby/downstairs area. That was the only disappointing thing, as it was a bit run down and barren. Hollywood Beach is within a 5-minute walk of Historic Hollywood Beach Resort while other popular sites like Hollywood North Beach Park are within a couple of miles (3 km). This 60-room condo building has conveniences like a beach bar, an outdoor pool, and a 24-hour fitness center. Each condo is air-conditioned and features a kitchen with a refrigerator, a microwave, and a stovetop. A TV comes with cable channels, and guests can stay connected with free WiFi. The bathroom offers hair dryers and free toiletries. Other standard amenities include a coffee maker, free local calls, and a safe. Dating back to 1925, Historic Hollywood Beach Resort features an outdoor pool, a children's pool, and a 24-hour fitness center. Self parking is available for USD 28 per night. A multilingual staff is on hand to assist with luggage storage and concierge services. Other amenities at this beach condo building include a spa tub, free WiFi in public areas, and laundry facilities. The condo has an outdoor pool, a children's pool, and a spa tub. Other recreation options include a 24-hour fitness center. 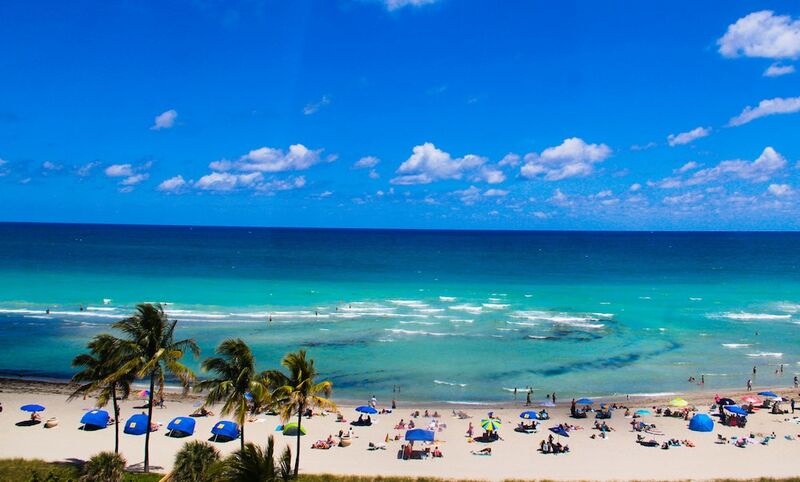 The preferred airport is Fort Lauderdale, FL (FLL-Fort Lauderdale - Hollywood Intl.). Driving? This property offers parking (fees apply). Guests must make arrangements for check-in by contacting the property in advance of arrival using the information on the booking confirmation. The minimum check-in age for Spring Break is 25 years old.